TRON is not a good movie, but it’s one of my favorites. For most of my adult life, I credited the video game for fostering that affection. I could never get past the third level, but it didn’t stop me from dropping quarters into the machine when I could. I’ve watched TRON a number of times in the past few years, the most recent a television broadcast. The movie looks great, its art direction forward-thinking enough to overcome the dated computer graphics. The actors do their best with the dialogue, but the story from 1982 has a naivety that pales next to the future that came after it. For all its faults, TRON holds a tight grip on my imagination. 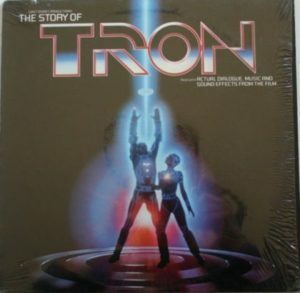 I never really examined why till my mom unearthed a vinyl record: The Story of TRON. Before VCRs and the home theaters it would spawn, Disney understood not all families could make a night at the movie theater, so it released condensed version of its movies on record with narrators describing the action between snatches of dialogue and music from the soundtrack. I desperately wanted to see TRON in a theater, but my parents wouldn’t budge until it played on a second run at a theater on base. So it was some months after the movie’s opening that I got to see it on the big screen. Well, kinda — I forgot my glasses, so most everything was a smudge. Until that day, I had to content myself with The Story of TRON. That might have ultimately ruined the movie for me. I played the record after more than 30 years and actually enjoyed hearing most of the story shaved of its cruft. In a way, listening to The Story of TRON is actually better than watching the movie. And I think I may have realized that when I finally got to see the movie. I had hoped for a life-altering experience similar to Star Wars. It didn’t happen. TRON fell off my radar as I got older, and I wouldn’t really develop fondness for the movie till I saw it again as an adult. At that point, I had to rib my younger self for falling for the onslaught of marketing at the time, but I had completely forgotten how The Story of TRON fueled much of that anticipation. When I moved out of my parents’ house in 1997, I took my record collection with me, but The Story of TRON was left behind, then subsequently forgotten for 22 years. It’s back in the collection again, its role in influencing my life full acknowledged.